As I mentioned in the prologue post about this Paris trip, one of the earlier decisions I made was to get out of my own Paris ruts by NOT staying in the St. Germain/Latin Quarter section on the Left Bank. I’m thrilled to my toes with that choice. Not that there aren’t crowds here in the Marais neighborhood, but they’re much, much smaller (in large part because there’s simply not room for hordes really). And I have yet to see a swarm following someone with a red bandana tied to the end of a stick. Within the first few days as we were getting to know the neighborhood (and slowly getting over jetlag), we walked around the area in increasingly broader radiuses around the apartment. On day three, when we got far as Notre Dame and the quotient of crowds and tour busses quickly went up exponentially, I found myself wanting to turn on my heels and head back to my new ‘hood. Even if you are staying smack in the middle of Paris, it’s not that hard to break away and explore some of the lesser-trod parts of the city and have some experiences that those waiting in line to get to the top of the Eiffel Tower would never have. It can start simply with walking around. Paris is a phenomenal walking city, my sister and I logged probably 50 miles (no kidding) in the dozen or so days we tackled the city together. Look up and around you, at the buildings, glance down passageways to see lovely courtyards, be alert to cool gardens you might not notice if you were zipping by too quickly or underground on the Metro. Keep an eye out for historic markers on the sides of buildings or posted at gates to public spaces. I enjoy this city (any city, really) when I get a sense of context and history and cultural perspective by just picking up information and impressions along the way each day. But here’s a really great and simple tool to use for some added resource to help bring something unexpected and different to your time in Paris: Pariscope. It’s a handy entertainment guide that comes out every Wednesday and is packed with information covering museums, theater, movies, art exhibits, music, kids activities, special events/fairs/expositions, you name it. They even have a small section on restaurants, but don’t pay attention to that. For less than a dollar, it’s a great investment available at those green newsstand-kiosks on Paris streets and at Tabacs. 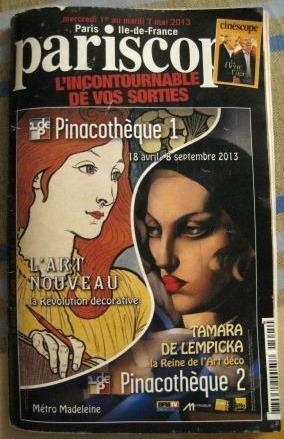 Yes, yes, it’s all in French. And you don’t speak/read French you say? Neither does my husband or my sister. And on the respective recent times they’ve been in Paris with me, I’ve handed them Pariscope just for fun, just to flip through. And without even asking them to do so, each found something distinctive that they were interested in. I think, actually, the fact that they don’t know French makes it a bit easier to filter out all those fussy words they don’t understand and home in on what they do know. Like, for my husband, computer games. Which led us to a very cool exhibit about the history of computer games at the Musée des Arts et Metiers a couple of years ago (which has a huge and fascinating permanent collection, and a Foucault’s Pendulum, worth a visit any day). On that same trip, I noticed a reference to Henri Cartier-Bresson, the legendary French photojournalist who has captured some of the most famous and compelling images of the past century. I had no idea there was a Henri-Cartier-Bresson Foundation until seeing an item in Pariscope, we visited the small museum space and saw an exhibit of an American photographer from mid-20th century shooting Chicago and New York (sorry to be forgetting his name right now). This past week, wandering around Montparnasse I was able to retrace steps to that space but it was closed until later this week. 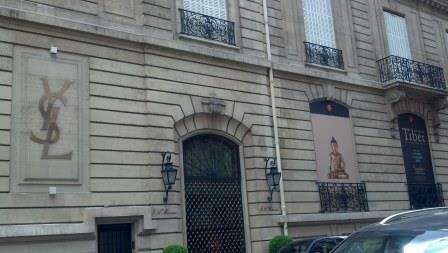 In the case of my sister, it was Tibetan sacred art (even in French, l’art sacré de Tibet, she got it!). 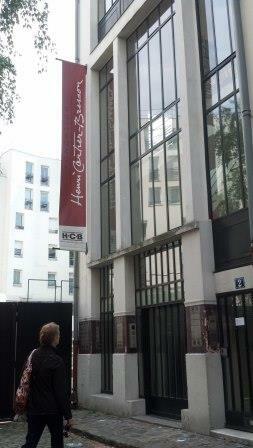 Which led us to discovering the home of the Fondation Pierre Bergé-Yves Saint Laurent not far from the Arc de Triomphe. It’s so off the beaten path it was an adventure to find, but once there it was a really amazing display of beautiful, historic pieces. Quiet, calming, inspiring. The Foundation supports and displays exhibits that cover a great range of artistic interests, from Japanese kabuki theater costumes to super-contemporary iPhone/iPad art. ♦ times posted on 24-hour clock so 10H = 10:00 am, 18H30 = 6:30 pm, 21H = 9:0o pm, etc. That should be enough to get you started! Hope you’ll have fun doing some extra exploring next time you’re in Paris. You may well be surprised just what you find…..